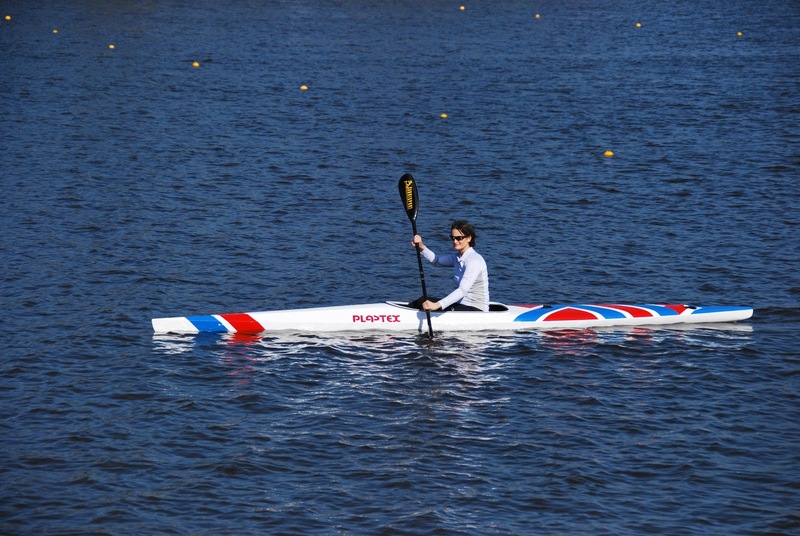 In exactly 2 weeks time I will be racing for Great Britain at the sprint kayak European championships in Portugal. 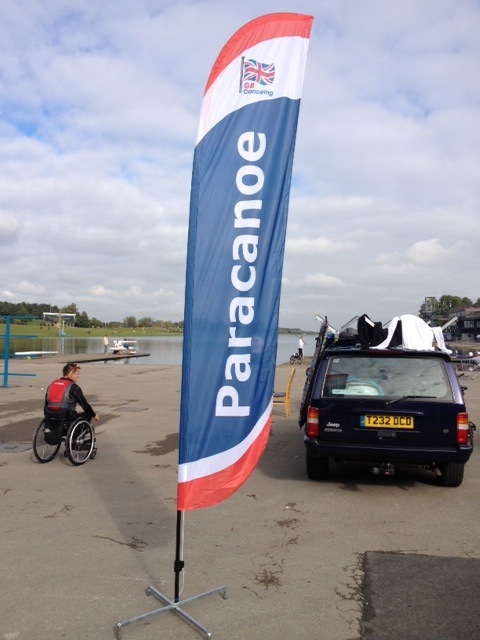 This will be an incredible championship, not just for me, but for para canoe as a whole. This is the first international championships of the new olympic cycle. It is also the first cycle that para canoe, (which will debut at Rio) will be included. I'm sure that because of this, new nations will be competing and new talent will be showcased. Athletes will have transferred from other sports into paracanoe and undoubtetly there will be many unknowns and 'dark horses' at this first international race. What I do know is that many nations will be upping their game now that para canoe is an Olympic sport and Olympic medals are the ultimate goal. New names will be put on podiums and new records will almost certainly be set. I am really looking forward to this race. I have been training hard for the last 7 months and despite this being my first international race in a kayak I'm excited more than nervous. I'm excited to see how I compare with the other new talent out there, I'm excited to see if my training aiming to change me from an endurance cyclist to a sprint kayaker has worked, and probably most of all, I'm excited to be racing against the established names in para canoe. A strange thing has happened at the river, the sun has finally come out!! ....After a long cold winter summer is trying very hard. 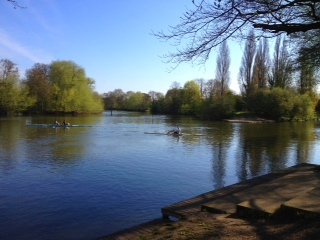 The blossom is colourful on the trees, small ducklings are learning to swim and sprint kayakers are training with no clothes on. Yes, that was my first response too as I did a double take when 3 men with bare torsos paddled past. Realistically they probably weren't completely naked... but you couldn't see below the boat line so how was I to know? This was the same day that my coach persuaded me to paddle bare foot- "she is starting me off gently" I chuckled to myself, "next week it'll be my socks and then my top..... " Naked paddling is obviously the way to go! To be honest I think I would have preferred to paddle naked than go through the training I have had in the last month. I have been totally stripped down, not in the clothes sense however but metaphorically with my technique. My technique was originally put together in a rush 7 months ago to enable me to achieve selection time- but now this basic paddling style had to change. My coaches all agreed I had to be stripped back down to square 1 with the intention of building something bigger and better in time for races later in the season. It has been the hardest thing I have ever had to do. Every inch of my brain has had to concentrate and learn new ways for my body to move- remember as a cyclist I've never had to rotate my torso and now rotation was the key. 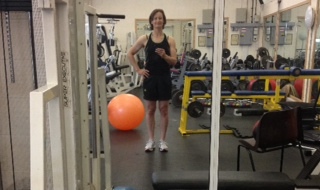 My timing needed to be changed- my legs feel things differently to each other so when I feel equal I'm not. I've had to learn to to use them 'unequally' which actually makes them work the same. Yes complicated! As a physio I know how the brain and body works, and it takes at least 6 weeks for a new movement pattern to become 'established' I was trying to learn not one new movement, but several interrelated patterns at once and I had less than 4 weeks to master them. Not just master them but be able to use them at sprint pace on wobbly water at the European selection regatta. My goal was to paddle better but I also wanted to win my races. This would enable me to qualify to race for team GBR at the European champs in June. As I said, I would have preferred to paddle with no clothes on than be stripped down metaphorically in this way so close to a selection regatta. In addition to my training sessions I have had to use every trick I know in my Physio 'tool box' to help expedite the process. I have practiced, practiced and practiced and discovered first hand muscles in places I have only ever seen on the chart in my treatment room. 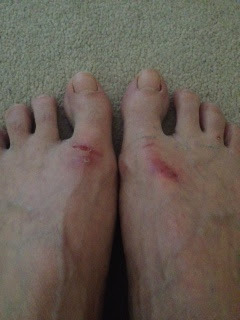 Keeping with the stripping bare theme, Ive developed some mighty fine sores on my feet where the skin has been stripped off the top from the pull bar, and from the bottom by the grip tape on my foot plate. Who needs a pedicure, pumice stone or ped egg to remove layers of hardened skin?? I'm happy to say that despite not feeling totally ready to be 'on show' I won my races - just! I also managed to hold onto my new technique - just! and I also managed to stay 'unequally equal' for the most part, despite the customary Nottingham wavy water and gusty side winds. 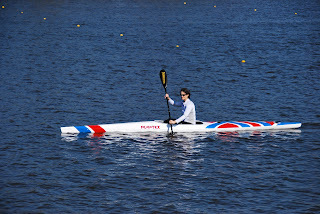 Its back to join in the 'naked' paddlers at Wey, where I hope I'll be getting less naked by steadily putting my 'layers' of technique and confidence back on as the summer progresses. I'm really looking forward to this challenge! Thanks again to Claire, Matt, Colin and Batty and all for your support - I can't do any of this without you.